The module FrameMerge offers the comparison of several video sequences by image superposition/overlay or by split-screen/mosaic. Create descriptive result movies for documentation or representation. 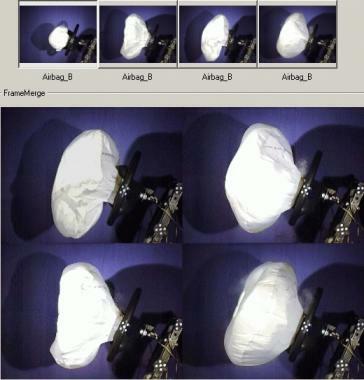 Recordings from different cameras with varying lenses and possibly variable view cut-outs are to be combined precisely aligned. The objects often cannot be configured with respect to their color and the environment is mostly fixed, therefore only small differences between congruent images can be expected. A clearly laid out working window integrates all necessary steps. Preview and thumbnail images enable an easy visual assessment and show you the result of the merging process. All inputs and settings can be saved as a document; template files allow a quick repetition of a following test. Express your test by multiple videos! translation, rotation, zoom and flipping. 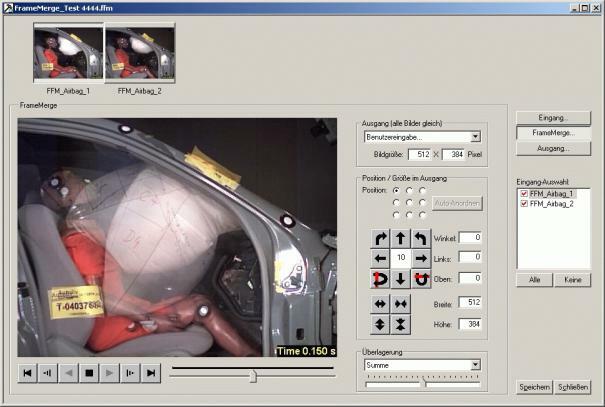 FrameMerge is available as extension to the base module QuickView.